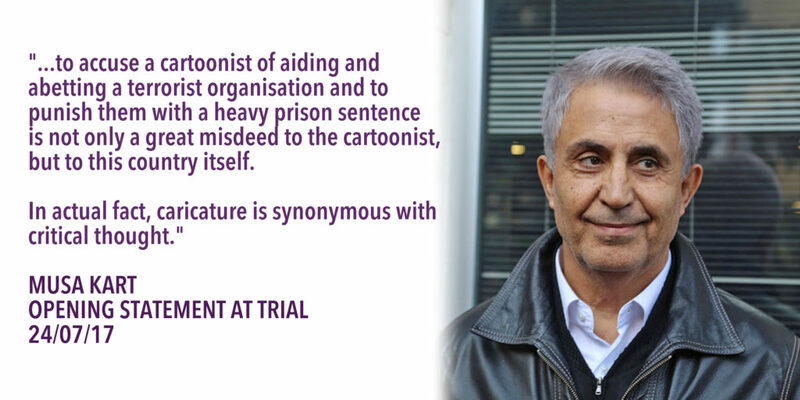 After a week of opening defence statements from the eleven members of staff from Cumhuriyet accused of crimes pertaining to terrorism, the majority have been released under judicial supervision, including cartoonist Musa Kart. The news from Istanbul tonight is better than could have been expected, ending the wholly unlawful pre-trial detention of seven of the staff and board members from the beleaguered newspaper. Naturally for the families of those returning to prison there is little comfort. The trial is set to resume on September 11th. In the meantime Reporters sans Frontieres remind us that a plethora of such cases will be heard. The regime of President Erdoğan remains the world’s worst for the imprisonment of journalists. 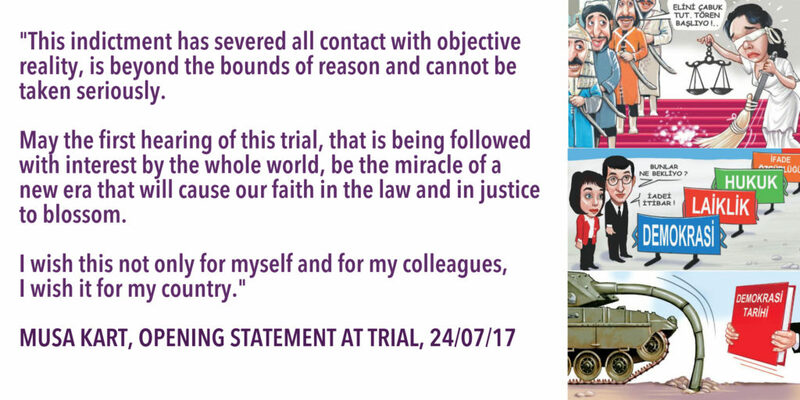 And the fight to prove the innocence of all concerned continues. Musa’s spirited defence of himself and the medium of cartooning earlier this week caught widespread attention, picked up by numerous organisations and outlets. Thanks to our friends at the American Association of Editorial Cartoonists, Cartooning For Peace, the Comic Book Legal Defence Fund, Bleeding Cool and a host of others for their coverage. We welcome Musa back to the outside world, wish his family well and await to hear from him in due course.